A wonderful friend of mine gave me a "One Sketch A Day" book for my birthday in March. I only recently started to "sketch" in it because I have a slight fear of journals. Now that I have started and had some bad days along with good days, sketching wise, I feel a little less intimidated about drawing in a book. This may be the kick starter I was looking for! I started this rainy morning in bed with Sandy Steen Bartholomew's Totally Tangled book. I have had this book for several years, but it is one I go back to over and over because it is packed with ideas and I always seem to come away from it with something new. She also uses color beautifully and I after drawing a couple tangles (I was catching up on days missed in my one-a-day) I decided to bring out my inexpensive colored pencils and see where it lead. It lead to a stress free morning and thought I would share. After I was finished coloring I still had three Tripoli left empty. 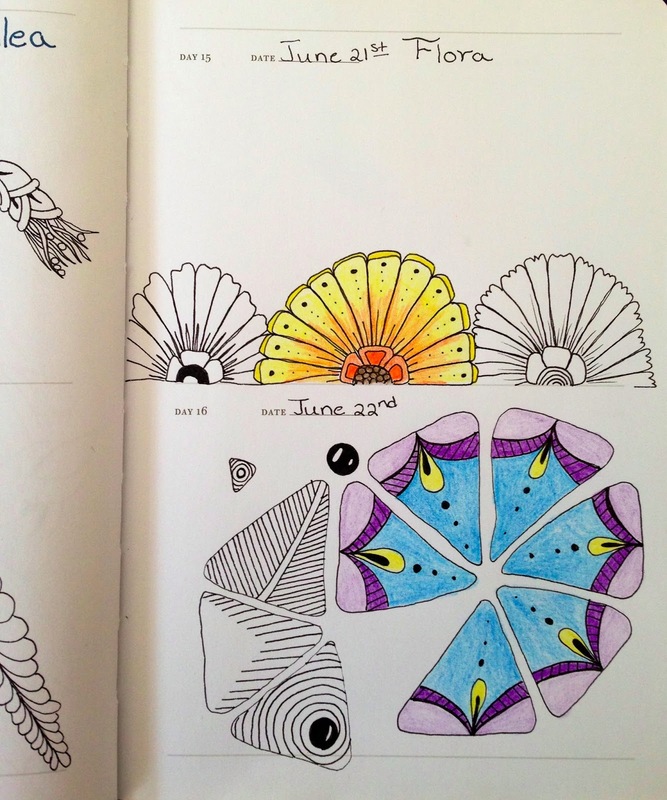 I opened The Art of Zentangle, a fairly newer purchase, to Margaret Bremner's section on Zentangle Mandalas. Margaret is a very talented artist and her work is beautiful. I am very fond of the way she uses black Pearlz and the balance of black and white. You see in the lower drawing I was playing with her ideas. That is such a good idea! 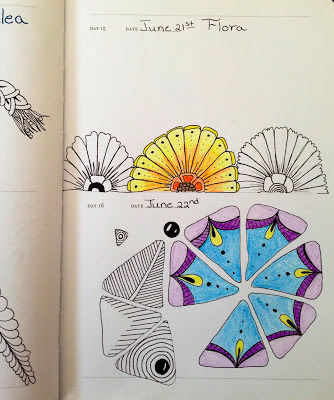 I have both those books, and honestly, I've only dipped into them periodically, but the idea of really studying them, a day at a time, makes a lot of sense, and could bring some needed order into my zentangle world! Thank you for this post!